If you’re looking for an easy way to perfectly hang a picture or mirror on a wall, you’ve come to right place! 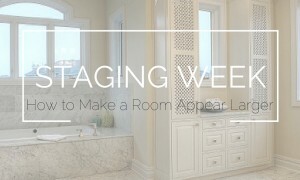 As we continue with Staging Week here on the Blue Matter blog, AFR Furniture Rental’s Talia Malizia shows us how to get it done. You won’t even need a measuring tape! All Staging Week videos filmed on location at: 56 Force Hill Road in Livingston, New Jersey. This expert shares why home decor is entirely different from home staging - and how it can help your home sell faster.